Summary SafeCopy is a newer cloud backup and storage provider that has some growing up to do before it can really compete with the more mature providers. SafeCopy is an interesting product. It aims to be transparent to the user, with a low impact on system performance and functionality. Low impact on the system is great for people on slower machines, but does it impact performance? Accounts are a fairly basic affair. Everyone can sign up for a 3.5 GB free account. From there, you can preview the full experience, without having to upgrade. The entry level pay-for account is 200 GB for $50/year. No monthly accounts are available, and the refund policy is not posted anywhere. We reached out to SafeCopy for explanation of the refund policy, and heard nothing back as of yet. We'll update the review if we do. A 300 GB account is also available for $70/year. Both 200 & 300 GB accounts can be bought in multi-year increments at increasing discounts for the more years purchased. Without knowing the refund policy, I wouldn't buy in for more than a year. Installation was straightforward for the platform you're on, with support for both Windows and Mac OS. I tested both clients, with most of the screen shots from Windows. Installation on Windows will start up SafeCopy automatically. But in Mac OS, you have to load the application yourself. Setup is wizard based, starting out with signing up for an account (or signing into an existing one). SafeCopy seems to follow Wuala's lead here and only allows for account creation using the client. The security of this is still questionable in my mind, unless SafeCopy has gone through the trouble of creating its own socket server and not using HTTP to transfer data. Once account creation is done, you can choose files to back up. 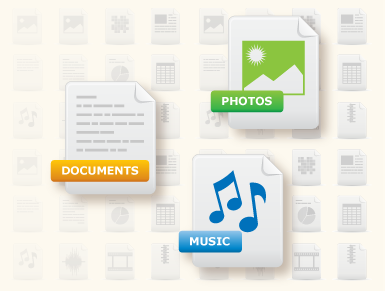 All the standard user areas, like Desktop, Documents, Videos, Music, etc. are selected by default. I argue that while this is the most complete backup, it also makes for a very large initial backup. But SafeCopy has a feature that ignores files over 200 MB in size, and allows you to go back and manually upload those large files later. This is easily disabled as well, and makes for a good approach. Once files are selected, uploading starts. Upload is very slow. Even with the automatic throttling disabled, I managed a whole 1 Mbps on my 25/25 home FiOS connection. SafeCopy is located in California, so even after dealing with two core routers to get there, I should have been getting about 5-8 Mbps. Once set up, Safecopy chugs along in the background and you'll forget about it, like most of the other cloud backup solutions. On Windows after running for a day, SafeCopy was at 37 MB of RAM used, or about half of Dropbox's average. On Mac OS (10.6.6), SafeCopy was even lower, at 19.6 MB utilized. Dropbox, however, is also lower, at 31.8 MB used. I can only attribute the difference to Mac OS being a better memory manager, which is common among Linux/BSD-based systems. SafeCopy offers a sharing system that is simple but functions nicely. SafeCopy will make a link that you can email either from the web or the client interface. This link can be set to expire in 24 hours or 1 week. It can also live indefinitely and be password protected. Files can be accessed through the web interface or the client. There is an iPhone interface but it's so bad I won't even bother talking about it (oops, I just did). Just avoid it until SafeCopy fixes it. The mobile website, on the other hand, is actually decent, but does not exist for the backend. First you will need to select your language. Next step in the process is to create your login, or add to an existing account. Next is to pick what files you want to backup. Additional files can be added through the right-click waterfall menu in Windows. The advanced settings for the client. The brightly colored windows client, doing its thing. The not so brightly colored Mac client. The mac client really feels like a beta product. The website presents search as its first option, and is overall a clean interface. Search works mostly based on extensions. Actual file names need to be rather exact. File browsing works well, if a little slow. Downloading folders results in zip files. Otherwise everything is a single file download. This error only seems to appear on Mac Chrome. Windows Chrome (and every other browser I tested) seems to be fine. Sharing is a simple setup, with email being the communication medium. Restore is an easy process, but is crippled at the same time. Restore can occur only on the website, which is really bewildering. Why would a company that forces you to sign up through its client, limit file recovery to its website?! Unlike upload, file download is fairly fast, and will max out many connections. I registered about 15 Mbps download, just a little over half of my available download bandwidth. I don't know where the throughput is being throttled. But if it's at SafeCopy, I'd like to see them provide higher upload speed. The restore process also needs to support the client. And as I say for most cloud providers, a method for shipping a USB drive for bulk upload and restore would be nice as well. Support is equally disappointing, with no real documentation available. There is a knowledgebase, but it doesn't contain much in the way of knowledge. The FAQ only contains the "Top 5" questions, all of which weren't in the knowledgebase. You can also open a ticket for Support, which I did but haven't heard back yet. Security is questionable. SafeCopy claims it uses 448-bit Blowfish encryption. But it does not allow a user to enter their own key, which is a reason to use Blowfish in the first place. My guess is this becomes an issue for the web interface to allow uploading and downloading, which means SafeCopy has the private key server-side as well. This means SafeCopy employees could decrypt your data, and subsequently makes it a problem for me to recommend. Overall, SafeCopy clearly has some growing up to do. Better documentation, allowing the client to do backups, improving security practices (and documentation of them) and a more responsive support line would be my votes. I would take a look at some of the other backup reviews here on SCB before going with SafeCopy.